Oprah Winfrey arrives for the presentation of Stella McCartney's ready-to-wear Fall-Winter 2019-2020 fashion collection, Monday March 4, 2019 in Paris. Oprah Winfrey is giving back. The philanthropist, global leader, book club connoisseur and media mogul has pledged $2 million to help revive Puerto Rico's arts and cultural programs, which took a hit after the devastating 2017 Hurricane Maria. Winfrey's donation will benefit two separate funds and organizations. Winfrey has made a $1 million donation to the Hispanic Federation's UNIDOS Disaster Relief &Recovery Program. UNIDOS helps "serve the immediate and long-term needs of families and communities in Puerto Rico" by distributing food and other necessities to those impacted by Hurricane Maria. The other $1 million will go to The Flamboyan Arts Fund, which was created by Broadway superstar Lin-Manuel Miranda. The Flamboyan Arts Fund supports theater, dance, literature, and other creative arts. The 65-year-old explained in a statement that she felt inspired by Miranda and his actions to ensure Puerto Rico has a sustainable and vibrant arts culture. Reese Witherspoon sits down with Seth Meyers and gushes about getting to work with Oprah and says she's better than she imagined. "I was so moved by Lin-Manuel Miranda's commitment to bring HAMILTON to Puerto Rico and support the community that served him growing up that I wanted to join in the revitalization efforts of an island so rich in culture, beauty and heritage," Winfrey said. She continued, "The needs of Puerto Rico and our fellow American citizens following the tragic hurricanes are still very real, and the work that has already been done by the Hispanic Federation, Flamboyan Arts Fund and other organizations on and off the island is long from over." In January, Miranda took "Hamilton" to the island of Puerto Rico for 23 shows, where he suited up once again for the lead role as Alexander Hamilton. The play was a fundraising effort for The Flamboyan Arts Fund and raised about $15 million. The play ran from Jan. 11-27, 2019 and it meant that he was not in attendance at the 2019 Golden Globes, but he explained the significance of his absence in a video aired exclusively on E! before the show. "I'm so thrilled to be nominated and honored to be nominated, but I'm in Puerto Rico," he said in the clip. "I'm playing Hamilton in a production we're opening here to raise as much money as we can for artists and artistic organizations still struggling to recover in the wake of Hurricane Maria." According to the New York Times, Shonda Rhimes, Questlove, Jimmy Fallon and Jos Andrs were among those who attended the play's opening night. 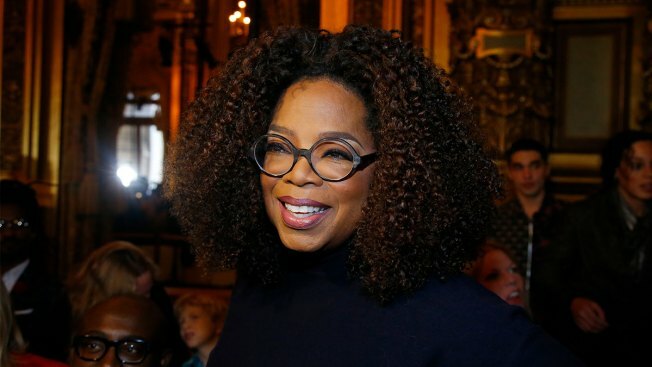 Oprah has done her fair share of philanthropy and inspiration. Aside from her Oprah's Super Soul Conversations (where Miranda was once a guest), her rousing speech at the 2018 Golden Globes sparked some hope among her fan base that she would potentially eye a run at the 2020 presidency. The Internet was all for it, but she confirmed in an InStyle interview that moving into 1600 Pennsylvania Avenue wasn't in the cards. "I've always felt very secure and confident with myself in knowing what I could do and what I could not," she told the magazine. "And so it's not something that interests me. I don't have the DNA for it." For now, she's working with Apple TV+ on a series of documentaries as well as the "biggest" and "most stimulating" book club we've ever seen.